The Gloucester County Craftsmen & Home Show is coming to the Gloucester County 4-H Fairgrounds 275 Bridgeton Pike (Rte. 77) on May 4th, from 10am to 4pm. This 9th annual event is designed for everything inside and outside the home. As a visitor, you and your family will be able to stroll leisurely through aisles and aisle of handmade crafts from over 100 craftsmen, enjoy home style cooking, live music, kids’ free craft making, pony rides, spring flower sale and picnic style dining. Craftsmen have been working all winter to create amazing art just in time for spring. Home Show companies representing hundreds of products and services will be on hand to help you with all your spring home improvements projects. Remodeling, floors, windows, doors, sunrooms, decking, guttering, landscaping, gardening, solar energy and more. You will be able to shop, talk to experts and compare prices- all in one easy location at this one-of- a- kind marketplace. Visitors to the event can enter to win a $500 Home Depot Gift Card and other home remodeling products. Drawing on the main stage at 3:00pm. The Little Miss & Mister Springtime Pageant for girls/boys 4-8 years old will be held at 2pm on the main stage. One queen & king and Queen’s court will be chosen from the contestants. This is a pet friendly event and families can enter the All Breed Dog Parade & Show at 12:00pm. Entry fee is a can of donated pet food for animal shelters. All dogs get a goody bag and ribbon for participating. Top twelve dogs will be chosen from the smallest to the tallest. Bring the kids out for a Spring Painted Rock Hunt at 10:30am to 11:00am. Over 30 painted spring rocks will be hidden around the fairgrounds. Finders keep the rock and receive a free prize at the gazebo. Meet at the gazebo at 10:30 for the first annual rock hunt. This event offers free parking and admission free. Artists, Craftsmen, Food, Home Show vendors are being sought and can contact Kathy Wright for show details at (856) 765-0118. 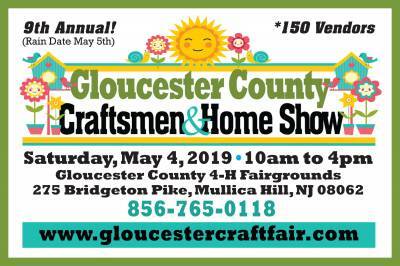 Visit the event website at http://www.gloucestercraftfair.com for vendor contracts, driving directions, pageant entry form and general show information. Rain date is Sunday, May 5th, 10-4pm.